Arriving in the hangover of the original Star Wars, hopes were high for TV's Buck Rogers in the 25th Century. Similar to the original Battlestar Galactica, things didn't quite work out that way. But with hype often comes a merchandising blitz. 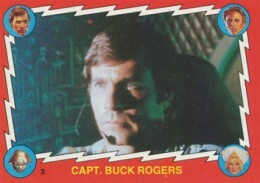 That means that we have 1979 Topps Buck Rogers trading cards to remember the show by. The base set has 88 cards, a fairly standard number at the time. Cards showcase many of the wild creatures, disco-infused wardrobe and dated effects. Borders are bright red with a white lightning pattern going around the outside. Each of the four corners has a head shot of Buck, Wilma, Twiki and Princess Ardala. 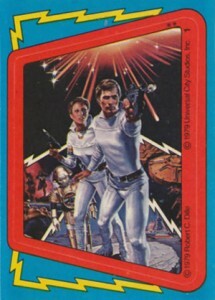 Card backs are green with an illustration of the heroic trio. The caption from the front is repeated at the top inside of an explosion with a short writeup beneath it. Like a lot of Topps sets from the 1970s, collectors are instructed to follow the set onto the next card. 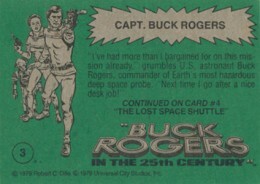 Keeping in line with the company's entertainment releases of the era, each pack of 1979 Topps Buck Rogers also has one sticker. Twenty-two make up the set. These have a blue outer border and a red frame around the image. There are also a couple of lightning bolts. Sticker backs double as puzzle pieces. Like BSG, time and nostalgia have been relatively kind to Buck Rogers. As a result, the cards still have an audience today. They're fairly easy to find, which keeps prices in check. But the colors, aliens and throwback to a strange era of Science Fiction television make for a fun and memorable release -- at least to those who choose not to forget about the show they're based on. 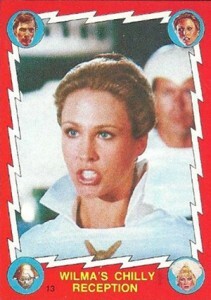 1979 Topps Buck Rogers came out long before autographs were a thing, at least in packs of trading cards. While they're not officially licensed as show merchandise, both of the lead stars, Gil Gerard and Erin Gray, do have autographs as part of Leaf's Pop Century line. Vintage Uruguayan Buck Rogers sticker album near mint!! VERY RARE!!! 16 (Gulp) The 25th Century? 29 Wilma to the Rescue! 41 Look Out World -- Lucky Buck is Back! 43 Heavy Losses for Wilma! 44 Get Off the Air, Buck! 46 Sorry About That, Guys! 48 Hey Wilma -- How'm I Doing? 50 The Party Girl Herself! 52 Hey...You Guys Know Any Rock? 54 The Princess Gets Down! 55 He Makes Me Soooo Mad! 57 Twiki Catches Disco Fever! 60 Disguised as a Space Pirate! 64 Wilma Gets the Message! 65 Here Come the Earth Forces! 77 Caught in Laser Light! 83 Off To new Adventures! I HAVE A BUCK ROGERS 1937 MEMBERS CARD FOR SALE WOULD YOU BE INTERESTED IN IT.